Joseph, Oregon, named after Chief Joseph of the Nez Perce Indians, is known as much for the area's scenic beauty as for its historical relevance. Situated in the semi-remote Wallowa Valley in Northeast Oregon, the city has been referred to as the "Switzerland of Oregon".� Surrounded by majestic peaks, idyllic lakeside vistas and quiet country settings, Joseph is a favorite destination for both outdoor recreationists and art aficionados. 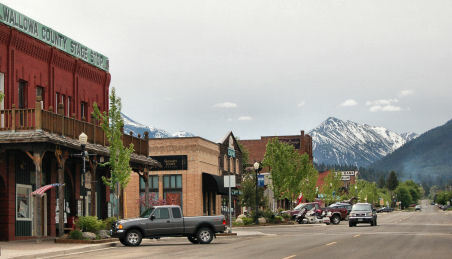 The small mountain community (which has less than 1,200 residents) supports a flourishing art colony and is the bronze-casting capital of the U.S.
Its small population size does not seem to deter economic growth in Joseph, which has numerous motels, bed and breakfast inns with which to accommodate visitors. The area is home to a number of seasonal events that include rodeos, art festivals and musical extravaganzas. The Chief Joseph Days Rodeo, is Joseph's most famous event and has been touted as one of the best western events of its kind in Eastern Oregon. Bronze, Blues and Brews highlights the artistic qualities of the area and features the works and music of Joseph's artistic community. Recreational opportunities abound in Joseph, which is located off Highway 82, southeast of La Grande. Surrounded by the Wallowa-Whitman National Forest and minutes from the Hells Canyon Recreational Area, Joseph is a magnet for outdoor adventurers. It is also a prime area for mountain biking and climbing, with famously warm temperatures during the summer season. Winter retreats feature nearby alpine and Nordic skiing with ample snow conditions and comfortable vacation settings.